Welcome to A Rare Find in Pigeon Forge! 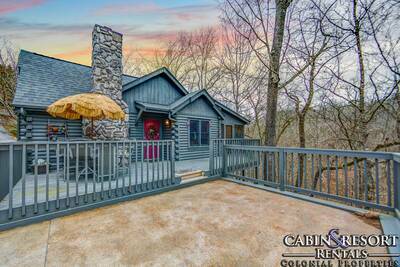 This amazing 1 bedroom, 2 bath Smoky Mountain cabin rental is the perfect place for your next vacation escape. Step inside this luxurious log cabin and you’re immediately greeted by soothing wood tones and large picture windows that frame the breathtaking mountain view. The comfortable living room provides you with relaxing seating, a fireplace, flat screen TV and access to the main level covered deck with rocking chairs. 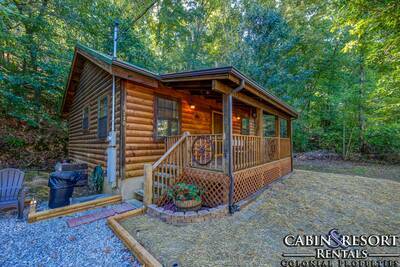 Also, there’s a full bath located nearby for added privacy and convenience. Located in the living room is the fun and wonderful children’s loft sleeping area. There are two queen sleeping futons here for the little ones to enjoy and have their private sleeping space. It is accessed via a ladder, therefore it designed for children that are able to climb. Adjoining the living room you will find the dining area and fully equipped kitchen. Here you and your guests can prepare, cook and serve your family meals all from the comforts of your Pigeon Forge cabin rental. Take a walk down to the lower level of A Rare Find and you’ll enter the wonderful game room. Here you’re treated to a flat screen TV, access to the deck where you’ll find a bubbling outdoor hot tub and an exciting pool table providing hours upon hours of enjoyment and fun. Additionally, located on this level is the gorgeous master suite bedroom. Here you’re treated to a custom log king bed, large windows that frame the Smoky Mountains and a full bath with jetted tub and separate shower. In the summer months, be sure to pack along your bathing suit and sunscreen so that you can take full advantage of the swimming pool located nearby. Just in case you need to do a little work or want to check your email while staying at A Rare Find, there’s complimentary WiFi internet for you and your guests to enjoy. 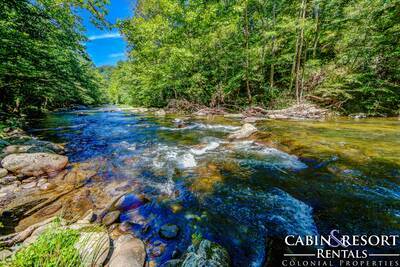 A Rare Find offers a great location in Pigeon Forge, just minutes from Dollywood, The Old Mill and The Island. 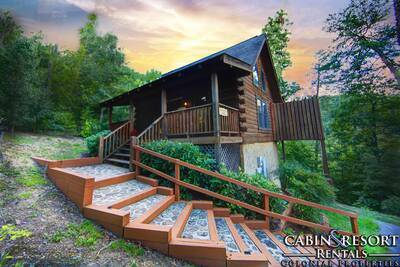 If you’re searching for a cabin with spectacular mountain views, a great location and all of the amenities and comforts that your heart desires, plan your next vacation at A Rare Find today! You won’t be disappointed! A: The address comes to you 2 days prior to your check in, and yes it is exclusive to you meaning you are the only ones renting that cabin for those dates. Yes, it does have cabin neighbors.